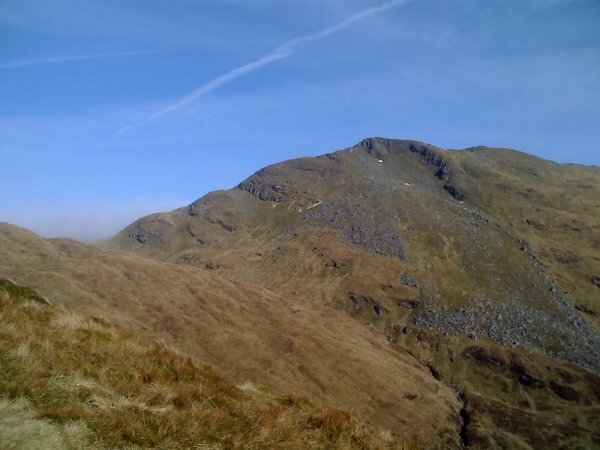 Ben Lomond is a solitary and distinctive peak to the E of Loch Lomond. From the Arrochar Alps, to the NW, Ben Lomond appears to have a conical summit but there is a craggy corrie high on its N slopes. N slopes are steep and craggy but S slopes are easy to moderate. The normal access routes lead from the S and do not encounter the crags until near the summit. 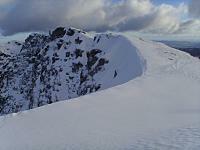 Ben Lomond has two parallel SSE ridges, to the W is the Ptarmigan Ridge and to the E the Sron Aonaich ridge. The "tourist" path cuts a broad swathe from Sron Aonaich to the summit. The ascent path by the burn that casacdes between Tom Fitich and Tom Eas at the S end of the Ptarmigan ridge is steeper and much more attractive. Following the Ptarmigan ridge leads to the W face of Ben Lomond from where a minor scramble through rocky outcrops leads to the summit. Ben Lomond 29th January 2010 - looking back over to Coire a Bhathaich and Coire Fuar - deep and frozen snow and ice. 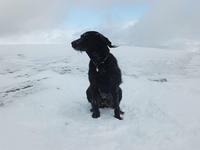 Ben Lomond - Sat 27th Dec 2008. 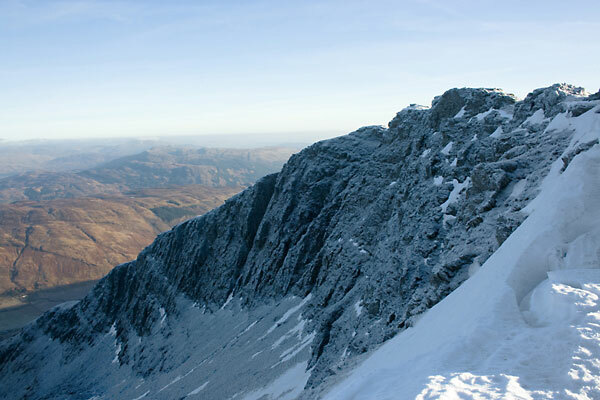 The summary information of one or more ascent routes that include Ben Lomond. 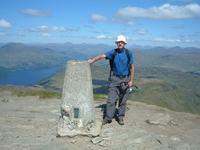 1 1006 m 11.88 km 4.5 hrs Ben Lomond An easy route on a broad eroded path leading all the way to the summit. Can be muddy. 2 996 m 11.37 km 4 hrs Ben Lomond The "Ptarmigan Ridge Route" is relatively easy but initially on steep slopes, which can be muddy in wet weather. This is a less used path past a beautiful cascading burn with picturesque waterfalls. Gav Man conquers his first ever Munro! 1 down 281 to go. 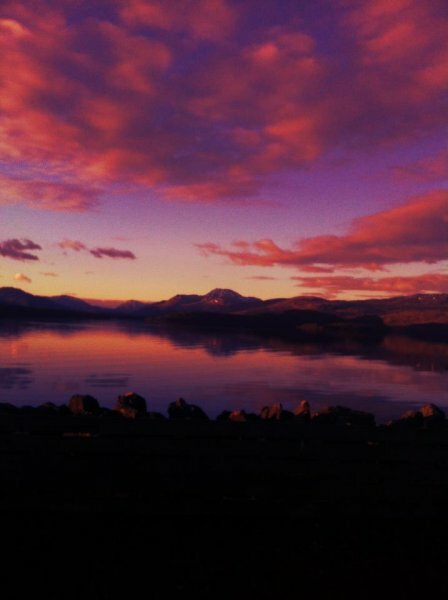 Post a few words about Ben Lomond or read what others have had to say. Showing the most recent 5 of 62 comments. Would you like to view all 62? Took the Ptarmigan route up; still snow on the path at the top which made it a little tricky; especially for the young party types who were coming off the other side in an interesting array of clothing!.. went down the tourist route, hundreds of people on the path including a group of young guys who had speakers and were playing gangster rap at full blast as they walked down. Interesting day in the hills; there's only one way to climb this hill if you want peace. Who is it that gives us real hill walkers a bad name??? Well take a trip up Ben Lomond on a mid November typical winter's day, with thick cloud at 2,000ft, constant seasonally cold drizzle, approximately a foot of wet snow and slippery ice from 2,500ft and then marvel at the crazies and dummies out on the tourist path. Turns into somewhat of a fashion parade as we see young girls in long flowing light dresses, athlete types in nothing but tight lycra & trainers, 2 Irishmen in golf shoes and chinos, OAPs setting out on their accent in late afternoon, need I say more?? Idiots!! Done my first ever Munro today, went up and down the Ptarmigan route, took 6 hrs up & down with a few stops on the way, didn't realise how steep it was in places, my legs were killing me on the way down, good job I had a walking pole with me (nearly never took it) got some good pics on my phone on the way up but the top was too misty for any decent pics, then I dropped my phone (only got it last week) and cracked the screen. Barring the phone incident (still fuming) it was an enjoyable day out, hopefully the first of many more Munros. Went up on the Ptarmigan route and came back down on the Tourist path. Started walking early in the morning so didn't see anyone on the approach to the summit. 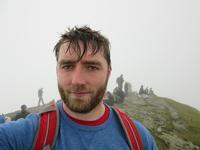 Visibility was zero on the summit so no good views but must have passed about 70 people walking the tourist route up. Having went both routes was well happy I went up on the Ptarmigan route. Took just about 4 hours.